This is just a belated self-indulgent intro post that provides info about my experience in psephology and politics, and my general political views, and a picture of me when I had much more hair. I'm putting it up so that I can link to it on the sidebar to encourage accuracy-in-pigeonholing, along the lines of Possum's piece here. That's my excuse, anyway. A disclosure statement has been added to the bottom of this page. I first became involved in elections at age 16 when I scrutineered the 1988 Hobart City Council cutup. From this time on I became a regular scrutineer in a range of election counts. At first, my interest was mainly in trying to forecast count outcomes from primary votes, and an early success was predicting Robert Bell's victory in the 1990 Senate cutup, against general media scepticism. I was very much encouraged in my early pseph efforts by the late George Howatt. 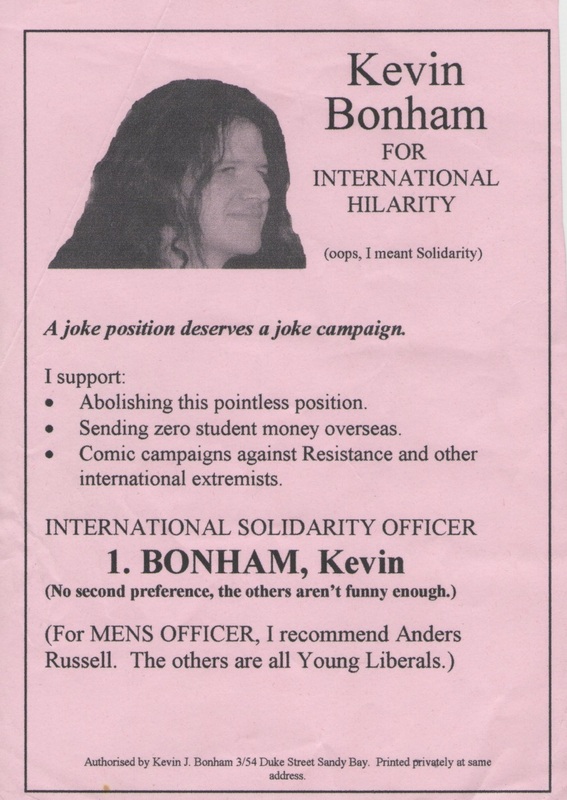 In 1997-2001 I was a regular writer for Togatus magazine, and often wrote political commentary, including often biased and deranged (but psephologically accurate) analysis of the annual student elections. This body of work led to my appointment as Editor in 2002 and 2003 and a media desk at the 2002 state election. I started publishing election analysis on Tasmanian Times and other websites and magazines in 2004, an early example being this piece. The excellent response to this early work and great support from the TT editor Lindsay Tuffin encouraged me to publish more pieces, including poll analysis and projections of election results (which I'd been doing for years for the interest of politically-minded friends, but not really publishing). My formal qualifications include a degree in political science and philosophy, but I have a diverse academic background and am mainly employed as an invertebrate science research consultant. As has been noted, this equips me well to study all manner of spineless creatures. But a much more useful indication was given by the old (sadly offline now) ozpolitics.info test, which gave me a small plus score (indicating trivially right of centre) for "economic policy", about the same for what it called "social policy" and -100 (indicating as far "left" as possible) on "traditional values". That helped because it breaks down what are often thought of as "social issues" into the religious-morality type claims (which I am generally completely opposed to) and a range of other issues on which my responses can vary. Generally, in practical terms, I support an approach to policy based on the presumption of liberty, which is not at all the same thing as actually being "a libertarian". If a person seeks to limit the apparent freedom of another to do something without interference from government, they should have either a very good reason, or a very strong case that the claimed freedom is not genuine in the first place. It is often easier to find such reasons in the area of economics than when dealing with so-called moral issues. This is partly because most property is grounded on some act of thuggery or government fiat somewhere down the line (even if it was many generations ago) and partly because issues of resource distribution have far more impact on the lives of other people. Stopping consenting adults from doing what they like to themselves and each other usually doesn't assist anyone else in the slightest, and even if it does, it's generally none of their business. The contra-green side of my views stems from my own experience as a scientist that claims made by environmental activists, in areas of interest to me (threatened species issues and forestry impacts, for example), are usually false or at least exaggerated. Even when environmental issues are clearly genuine and scientifically established there is a tendency - not confined to activists but also shared by some "experts" - to exaggerate the degree of alarm required. I have never been a member of any political party. Although rumoured to have stared at the screen fixatedly during the Watergate hearings, I only became seriously interested in politics at the age of nine or ten at the time of the Franklin Dam dispute. From that time until the early 1990s I was generally left-wing (though not always so on particular issues) and tended to support the proto-Greens or Democrats. One of many seeds of doubt was sown in the early 90s when I watched a video about the Ehrlich-Simon bet and noticed not only that Paul Ehrlich had lost, but that he had lost gracelessly. Yet Ehrlich was treated by many greens as some kind of guru, despite a track record of being wrong. The real change, however, came around 1993 when my political-philosophy reading at the time convinced me that my existing attitudes towards issues of personal freedom and economic freedom were severely inconsistent with each other (something true of most orthodox left- and right-wingers I encounter). Also at the time I became interested in the Voluntary Student Unionism issue - on which I became quite a high-profile campaigner and even once appeared on the same debating team as Abetz and Kennett* - mainly because it was neither believable nor acceptable to me that students were being coerced to fund religious student societies. I took a sharp swing to the (new) right, but I couldn't fondly embrace the conservative "Liberals" either, so at the time my voting was best described as confused (in 1996 I cast the classic "gateway drug" vote, Democrat with preferences to Liberal, in the Senate.) Into the late 90s I decided the comparisons that had caused my shift were over-simplified, and started moving down a sort of green/capitalist hybrid line towards somewhere near where I had come from. I even voted Green in sympathy in the 1998 state election after the major parties changed the number of seats in each electorate in a way that disadvantaged the Greens. (Strictly speaking, my vote was Informal, with preferences to the Greens. Confused? There was a candidate called Informal on the ballot!) It appears mine was the only sympathy vote the Greens, under the leader/brinksmanship of Christine Milne, attracted in that state election. Furthermore, the Greens lost my sympathies decisively in 1999-2001 when they backed opposition to the removal from the Tasmanian threatened species list of a snail which my forestry-supported research had shown to be hundreds of times commoner than previously thought. This was an eye-opener because the Greens not only had their science totally wrong, but were not willing to abandon false but politically convenient views even when the facts were made abundantly clear to them. Their errors were far less innocent and well-meaning than I'd realised, and I soon discovered that this was far from an isolated case. (It did spawn my first appearance in Senate Hansard, which can be seen in this PDF at pp 23662-3). In state and federal elections from 2010 on I've voted mostly for independents (primarily Andrew Wilkie) and in the 2014 state election I distributed my preferences between Labor, Liberal, Green and, generously, PUP, in a semi-random fashion (I ranked the candidates within each party, but then hopped between parties in a random order). For the 2018 state election I have decided not to disclose my vote. I have a keen interest in Hobart City Council politics, probably largely as a result of my mother's career on Council as an alderman from 1990 to 2002 (and Deputy Lord Mayor for the last eight years of that). Apart from four contested chess organisation appointment votes (current score 3-1; scrutineer for this and this one were the most interesting ones), I have only once, so far, been a candidate for a contested election. 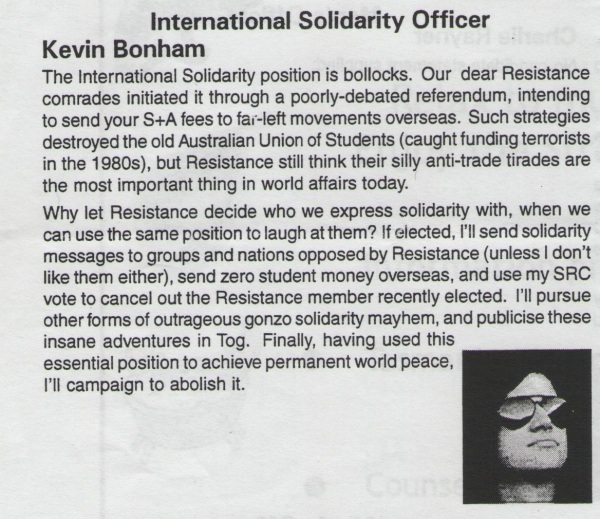 In late 2001, Resistance (youth wing of former DSP, now Socialist Alliance) caused a referendum to be held at the Tasmania University Union. The referendum was on whether or not to add a position called "International Solidarity Officer" to the Student Representative Council. The SRC already had a position for International Students, but this extra position was supposed to build solidarity with student movements overseas. As students are gullible and idealistic, the referendum passed and the position was created. I decided to contest it in the by-elections as a "joke candidate" to make sure Resistance could not get the position unopposed and confident that if it was me against them I would win. I was flabbergasted and severely wrong-footed when it turned out that having got this position created in an attempt to further their ideals, Resistance did not even run for it. Instead my opponents were a Young Liberal and another non-left candidate who had both been beaten in the main election, thought the position was as much of a joke as I did, and saw the ISO by-election as a chance to win something and get on SRC. My main aim in nominating accomplished, I pressed ahead regardless (and for years had a huge spare supply of pink paper) but finished second to the Young Lib by a few dozen votes (it was about 56:44 two-candidate preferred). In the words of Hunter S Thompson, whose Freak Power campaign for Aspen most certainly inspired my little tilt,"I'd still be in jail if I'd won". A few years later, by referendum, the position was abolished. * I am not, and never have been, a member of any political party, nor a candidate for any local government, state or federal election. * I am not, and never have been, a payroll employee or long-time contracted worker for any political party or candidate for any local government, state or federal election. * I receive donations from a range of people, often but not always known to me, of various political persuasions and interests. Of those donors whose politics are known to me, there is an overall lean to the left thus far although donations are obtained more or less across the spectrum. I do not believe this has yet affected my objectivity but anyone on the right concerned about this imbalance needs to convince their friends to donate more. * I am now and then commissioned on short-term contracts to provide paid specialised election analysis, polling advice or scrutineering assistance for individual candidates, parties or third-party campaign groups from a range of political backgrounds. It is often impossible for me to unilaterally disclose that I have been commissioned or by who. I do not accept offers that seek to influence content on this site, or that would require me to make any statement in any medium that I did not believe to be true. These services are currently available - subject to the nature of the task and my availability around other commitments and interests - to all parties or candidates whatever their politics. * The above said there are some kinds of parties I would prefer not to work for and I reserve the right to require any client to pay an estimated cost for all services upfront. * I also now and then provide scrutineering services and polling advice voluntarily (read: subject to bribes of alcohol, pizza or chocolate) for a range of candidates and groups of my choice. * I am now and then commissioned to provide expert paid commentary and analysis for electoral authorities, parties in electoral court cases or media sources; the latter from time to time includes a certain distant arm of the Murdoch galaxy. I do not generally receive payment for media interviews, though I may refuse to provide written comments or forward detailed data unless paid. * I am not currently an employee of the University of Tasmania, and have rarely been such in the past, but have often been a voluntary research associate there. As of early 2017, this status lapsed and I have no formal involvement with Utas. Have you seen the new Vote Compass on the ABC website? I know it's a bit different to the usual content of this blog, but I'd love to hear your opinion on how accurate you think it is at aligning opinions with political parties. 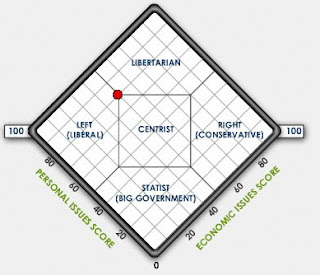 It's not that different to placements I have received from other political compasses - it places me as socially liberal (whatever that is in its view) and economically a little left of centre. 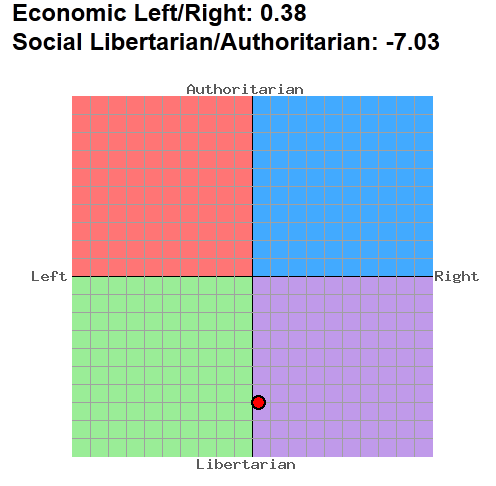 What is interesting though is the contrast between it and Political Compass, which places Labor as basically a centre-right party albeit less right-wing than the Coalition. This one places Labor as a moderate left party relatively close to the Greens. I think that's a function of the list of questions asked. There were not a lot of traditional environment-vs-development questions (logging, mining and so on) but for many voters these questions are a big demarcation point between the Greens on one hand and Labor and Liberal on the other. Including such questions would have pushed Labor (and also me) further away from the Greens. I also suspect their concept of "social liberalism" is a bit fuzzy and is more of a US-style "liberal" concept than the "libertarian" axis often seen on these things. 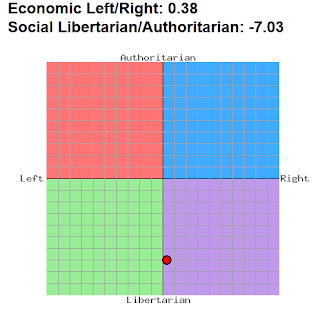 I couldn't see where I got marked closer to centre than the Greens based on the genuine issues of freedom that were included, so I wonder if that axis is contaminated by asylum seeker issues (for example). A very good feature is the leadership section. That seems to serve as a bit of a proxy for picking up issues missed by other questions. A bad question, I thought, was the school funding question. A disagreeing response could mean a lot of different things. As Gillard recovered, so can Abbott? Is The "Killing Season" Real?